The pathPlannerRRT object configures a vehicle path planner based on the optimal rapidly exploring random tree (RRT*) algorithm. An RRT* path planner explores the environment around the vehicle by constructing a tree of random collision-free poses. Once the pathPlannerRRT object is configured, use the plan function to plan a path from the start pose to the goal. planner = pathPlannerRRT(costmap) returns a pathPlannerRRT object for planning a vehicle path. costmap is a vehicleCostmap object specifying the environment around the vehicle. costmap sets the Costmap property value. planner = pathPlannerRRT(costmap,Name,Value) sets properties of the path planner by using one or more name-value pair arguments. 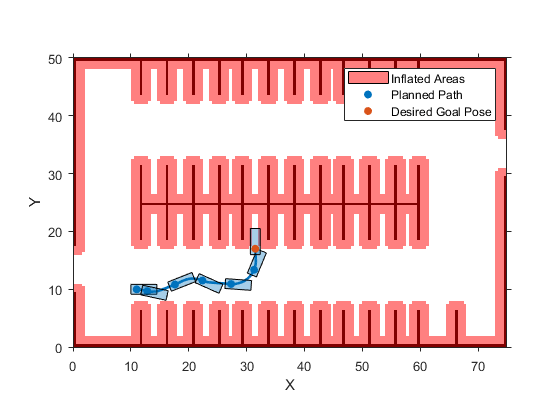 For example, pathPlanner(costmap,'GoalBias',0.5) sets the GoalBias property to a probability of 0.5. Enclose each property name in quotes. Costmap of the vehicle environment, specified as a vehicleCostmap object. The costmap is used for collision checking of the randomly generated poses. Specify this costmap when creating your pathPlannerRRT object using the costmap input. Tolerance around the goal pose, specified as an [xTol, yTol, ΘTol] vector. The path planner finishes planning when the vehicle reaches the goal pose within these tolerances for the (x, y) position and the orientation angle, Θ. The xTol and yTol values are in the same world units as the vehicleCostmap. ΘTol is in degrees. Probability of selecting the goal pose instead of a random pose, specified as a real scalar in the range [0, 1]. Large values accelerate reaching the goal at the risk of failing to circumnavigate obstacles. Method used to calculate the connection between consecutive poses, specified as 'Dubins' or 'Reeds-Shepp'. Use 'Dubins' if only forward motions are allowed. If you use this connection method, then the segments of the planned vehicle path are stored as an array of driving.DubinsPathSegment objects. If you use this connection method, then the segments of the planned vehicle path are stored as an array of driving.ReedsSheppPathSegment objects. The MinTurningRadius property determines the maximum steering angle. 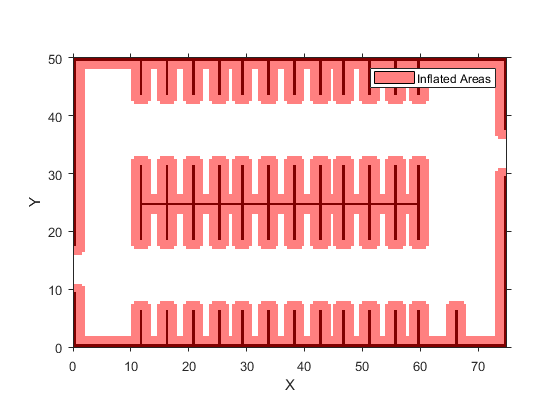 Maximum distance between two connected poses, specified as a positive real scalar. pathPlannerRRT computes the connection distance along the path between the two poses, with turns included. Larger values result in longer path segments between poses. Minimum turning radius of the vehicle, specified as a positive real scalar. This value corresponds to the radius of the turning circle at the maximum steering angle. Larger values limit the maximum steering angle for the path planner, and smaller values result in sharper turns. The default value is calculated using a wheelbase of 2.8 meters with a maximum steering angle of 35 degrees. Minimum number of planner iterations for exploring the costmap, specified as a positive integer. Increasing this value increases the sampling of alternative paths in the costmap. Maximum number of planner iterations for exploring the costmap, specified as a positive integer. Increasing this value increases the number of samples for finding a valid path. If a valid path is not found, the path planner exits after exceeding this maximum. Enable approximate nearest neighbor search, specified as true or false. Set this value to true to use a faster, but approximate, search algorithm. Set this value to false to use an exact search algorithm at the cost of increased computation time. Plan a vehicle path to a parking spot by using the RRT* algorithm. Load a costmap of a parking lot. 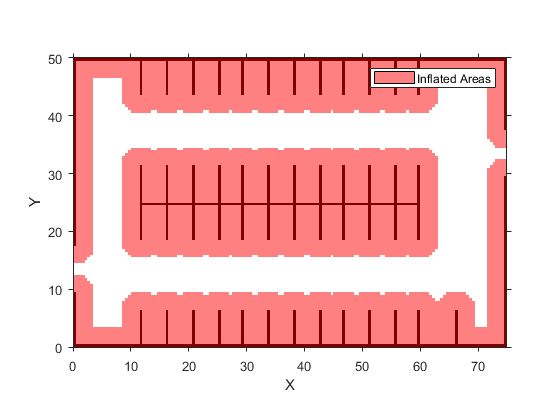 Plot the costmap to see the parking lot and inflated areas for the vehicle to avoid. Define start and goal poses for the path planner as [x, y, Θ] vectors. World units for the (x,y) locations are in meters. World units for the Θ orientation values are in degrees. Create an RRT* path planner to plan a path from the start pose to the goal pose. Plan a vehicle path through a parking lot by using the optimal rapidly exploring random tree (RRT*) algorithm. Check that the path is valid, and then plot the transition poses along the path. Define start and goal poses for the vehicle as [x, y, Θ] vectors. World units for the (x,y) locations are in meters. World units for the Θ orientation angles are in degrees. Use a pathPlannerRRT object to plan a path from the start pose to the goal pose. Check that the path is valid. Interpolate the transition poses along the path. 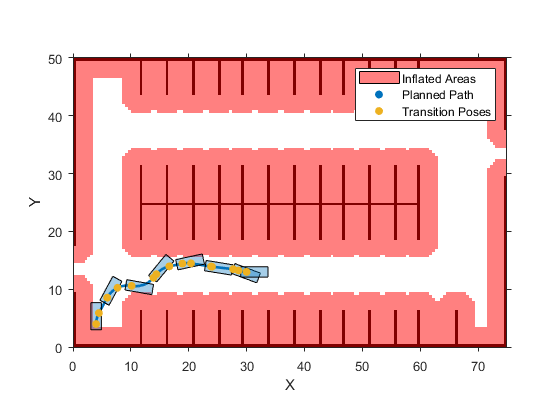 Plot the planned path and the transition poses on the costmap. Updating any of the properties of the planner clears the planned path from pathPlannerRRT. Calling plot displays only the costmap until a path is planned using plan. To improve performance, the pathPlannerRRT object uses an approximate nearest neighbor search. This search technique checks only sqrt(N) nodes, where N is the number of nodes to search. To use exact nearest neighbor search, set the ApproximateSearch property to false. The Dubins and Reeds-Shepp connection methods are assumed to be kinematically feasible and ignore inertial effects. 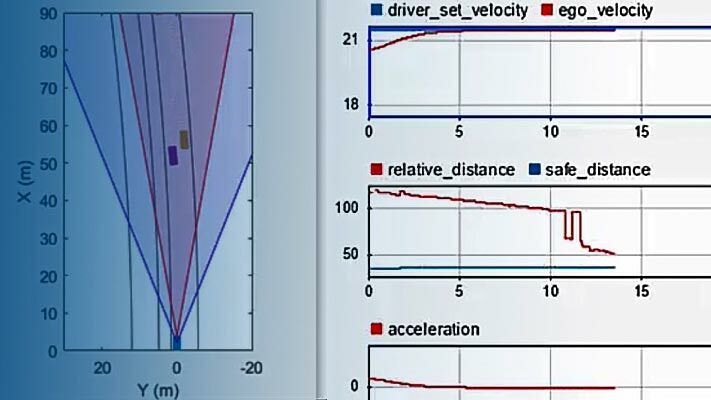 These methods make the path planner suitable for low velocity environments, where inertial effects of wheel forces are small. Karaman, Sertac, and Emilio Frazzoli. "Optimal Kinodynamic Motion Planning Using Incremental Sampling-Based Methods." 49th IEEE Conference on Decision and Control (CDC). 2010. Shkel, Andrei M., and Vladimir Lumelsky. "Classification of the Dubins Set." Robotics and Autonomous Systems. Vol. 34, Number 4, 2001, pp. 179–202. Reeds, J. A., and L. A. Shepp. "Optimal paths for a car that goes both forwards and backwards." Pacific Journal of Mathematics. Vol. 145, Number 2, 1990, pp. 367–393. The ConnectionMethod, MinIterations, MaxIterations, and ApproximateSearch properties must be compile-time constants.